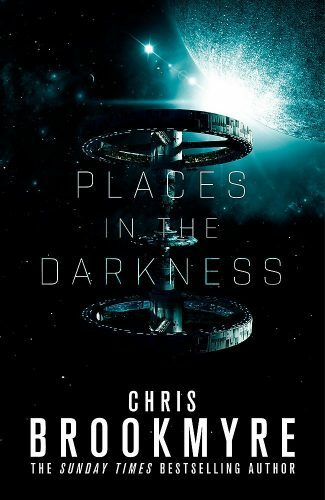 Places in the Darkness is the first foray into science fiction of Chris Brookmyre, a Scottish author previously known for his fast-paced and humorous crime, mystery, and noir work, which has won him multiple crime and comic awards. In this new venture, he sets out to transpose aspects of this approach into a space setting, offering readers a gripping mystery set aboard humanity’s first city-sized space station—complete with unwitting androids, near-future corporate politics, ominous mind-control technology, and a villain embodying science and control gone wrong. Control is a theme throughout the book—how far should anyone be willing to go to retain or enforce human compliance on the frontier and where does the desire for maintaining law and order become something more sinister? In particular, how much room is there for bending the rules, for the kind of “release valve” offered human nature by a little harmless crime and black market trading? Indeed, how much of this might even be necessary as humanity advances? Brookmyre builds his setting in a way that will feel familiar to fans of Deep Space Nine or Babylon 5, except that the station where the action in this novel is set is much closer to home and lacking any non-humans. Ciudad de Cielo is humanity’s first long-term experiment with extended life in space, a double-wheeled station reached by a climb up a space elevator to geostationary orbit and then a brief shuttle ride to where the station hangs in high orbit. What is most reminiscent though of DS9 and B5 is the sense of the contrast between polished science and efficiency on the surface, juxtaposed with a seedy underbelly. The station is even affectionately referred to throughout the book as “Seedee,” short for CdC. The story centers around Nikki Freeman (whose gender, interestingly, is obscured on the dust jacket summary of the plot), a callous, world-weary security officer on CdC. Nikki also runs a protection racket on the side for the various illegal bars and brothels operating in the grey spaces on the station, places that feel like a darker version of DS9’s “Promenade” or B5’s “down below.” Nikki’s superiors have largely turned a blind eye to the organized crime and the economy of vice operating at the margins of the station, and they (along with Nikki) become worried when they get word a new oversight officer is being sent up from Earth. The fear is that a straight-laced, by-the-book inspector will try to clean this all up, or that Seedee, which has operated more or less independently of Earth control, will come under tighter supervision if this new officer isn’t steered away from examples of grosser violations. The problem is that this oversight officer, named Alice Blake, in contrast to the practical, jaded Freeman, is just as straight-laced, by the book, and apparently naïve as Freeman and her superiors had feared. In fact, Alice is so rules-oriented and uptight that Freeman, who is assigned as sort of chaperone, has a difficult time shepherding her effectively. This would have been an excellent opportunity for Brookmyre to play up the contrast between them for humor, especially as some of his past books seem to have been in this vein, but their interactions seem forced, uncomfortable, and wooden. Plus, the plot begins to move so quickly that there is little time to develop a believable basis for the camaraderie and grudging respect that Brookmyre will manufacture between these characters as the story develops. On top of this, from the very first scene where readers are introduced to Alice in the text, Brookmyre drops heavy hints that she is much more than she appears; indeed more than even Alice herself is even aware. There are problems with her memory, unexplained blackouts, hints about her past, and a strong emphasis on her machine-like efficiency. For readers familiar with sci-fi tropes and a working knowledge of Blade Runner, it’s obvious from the first pages we should suspect that Alice is some kind of artificial intelligence—so much so that when halfway through the book Alice has a crisis regarding her own identity, most readers will be wondering why it took her so long. The stakes rise and Alice becomes something more than just a painful inconvenience to Nikki when a gruesome murder on the station indicates that the petty crime allowed to thrive (with the rational that everyone, and especially folks living in the difficult environment of space, needs opportunities to blow off some steam) might be bubbling out of control. And Freeman’s assignment of chaperoning Alice derails when first Freeman herself and then Alice become primary suspects as the number of murders multiply. Of course, neither of the women is involved in the way anyone expects, and they soon learn to put aside their differences and mutual dislike and work together, navigating the claustrophobic bowels of Seedee in an effort to find out what’s really going on. Brookmyre’s prose is terse and focused, moving the story forward in staccato bursts of a few pages at a time. The book seems constructed to be read in short bolts, on a train to the office, perhaps, which means the pace never lags even as the plot twists, thickens, and begins to curdle. But it also means that Brookmyre never really succeeds in building an effective feel for the station. This is problematic, because ideally the station itself should become a character in the action, but Seedee never seems more than a set—a thin representation of a crime-novel city translated into space. I never quite found myself believing it was indeed in space, despite Brookmyre’s technical details. One attack takes place, for instance, when the station’s rotation is arrested and gravity fails. In another scene the characters navigate the magnetic conduits that shunt cargo around beneath the buildings. At yet another point, Brookmyre notes that the moon is always full in Seedee’s sky—though it’s not clear why this would be the case. In all these instances, and throughout the novel, the background nonetheless felt flat and somehow thin. Nikki is luring Julio into a vacant building, but instead of a description of this setting that sets up atmosphere and foreboding—something I would expect from someone with a background in noir—the reader gets dry technical description of what this place is and does. This happens frequently throughout the book. Though on some level it makes Seedee feel logically possible, especially as an interlocking system of businesses and manufacturing interests, it keeps it from having the verisimilitude of a real human habitation. All this comes out in convenient bits and pieces as our heroes tour the station collecting the requisite clues. Freeman’s name is cleared, Alice realizes she is not a murderer with the revelation of a convenient (and somewhat literal) deus ex machina. Freeman and Alice begin to trust each other and develop a mutual respect as they race toward a confrontation with Gonçalves. Yet once Gonçalves is defeated, the question remains whether the seediness that makes CdC “liveable” in Nikki’s mind will survive Alice’s oversight. What’s interesting to me is how specifically Brookmyre feels he needs to emphasize that things do indeed go back to “normal.” Of course, the new android sheriff has predictably learned what it means to be truly human: “My experiences here,” Alice explains, “have taught me how we all need to misbehave sometimes in order to feel alive . . . We each of us have our private temptations, our secret transgressions. They’re part of what makes us human” (p. 399). It seems a strange sort of humanist sermonizing, but it allows Brookmyre to reset the scene, with Nikki resuming her crusty ways, Alice overlooking a little harmless bootlegging and prostitution, and Seedee still representing a tarnished bit of humanity in the night.